They say one should not dwell upon death, but rather celebrate life. One year on, it is still difficult for the family of Mohamed Hanaa Abdel Fattah Metwaly (popularly known as Hanaa Abdel Fattah) to “celebrate” without feeling the weight of his loss. A great man of theatre, Abdel Fattah was also a father who brought theatre home to his family. His stories about the theatre were always filled with jokes, many of which we already knew by heart, yet we enjoyed listening to them time and again as much as he enjoyed telling them, each time with different theatrical effects. Any child would dream of a life filled with the theatre, puppets, games and practical jokes, which Abdel Fattah spent hours to prepare. He loved children and enjoyed encouraging their artistic spirit. An early morning phone call from a Cairo hospital on 19 October 2012 informed his family that his life had come to an end. Perhaps instead of “celebrating” his life, one may simply honor his memory by trying to freeze the moments that were especially dear to my father, Hanaa Abdel Fattah. Born in 1944, Hanaa Abdel Fattah began his artistic career at a young age. “My mom hoped I’d become a doctor, but when she saw that acting in radio then theatre and films was my passion, she supported it wholeheartedly,” Abdel Fattah used to recall when speaking about his mother, always with warmth and love. His father was a journalist working in the national radio. He was the author of Shakhseyat La Tonsa (Unforgettable Personalities), a series of articles in which he explored the lives of artists who had been forgotten. Possibly because of this close link with radio and the arts and knowing the hardships of the field, at first, my grandfather did not welcome the idea of his son choosing a career in theatre. Yet, against his father’s will, together with his sister Souheir, Abdel Fattah decided to enter a competition for children organized by Baba Sharo (renowned radio figure Mohamed Mahmoud Shaaban). Souheir was accepted onto the radio show, but eight-year-old Abdel Fattah was asked to improve his pronunciation before he could join. Determined to join his sister, he locked himself in a room for two weeks working on his pronunciation. He returned to Baba Sharo two weeks later proudly demonstrating a clear ‘s’ instead of his previous ‘th’. His talent as a child soon brought him leading roles on numerous radio programmes and series. Many remember his voice as Sindbad in Sindbad the Sailor reaching the homes of many Egyptian children in the 1950s. From voice overs on the radio, he moved to acting at the stage of the National Theatre and then later to films. One of the roles closest to Abdel Fattah’s heart was the one in which he played the young boy selling candies on a train in Youssef Chahine’s feature film Bab El Hadid (Cairo Station). “We were raised among artists… The direct interaction with the great actors and directors of that time and all the care I used to receive from the older generation were among the most important factors that made me fascinated about the field,” my father used to tell us. During his many artistic endeavours, the late Amina Rizk, classic Egyptian actress, imprinted a special place in Abdel Fattah’s heart. For many years, she played role of a second mother whenever the young Abdel Fattah spent long evenings at the radio station or the theatre. He maintained a warm relationship with her until she passed away in 2003. The career of the “miraculous child,” as described by one critic of that time, continued to grow, but directing began to call to him more than anything else. He entered the High Institute of Theatrical Arts in the theatre, acting and directing department. At the same time, he studied script-writing at the Egyptian Cinema Institute. 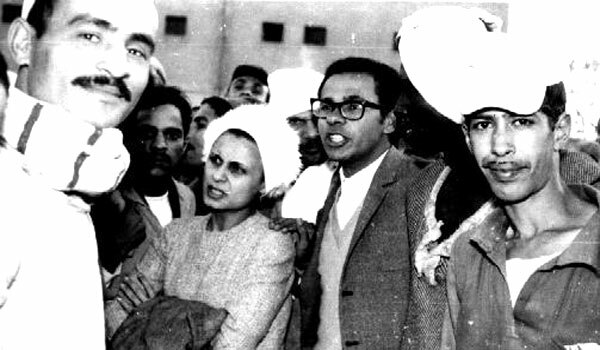 After graduating with honors, and shortly thereafter being appointed head of the Cultural Palace in Hurghada in 1968, Abdel Fattah staged one of the most remarkable theatrical achievements of his time with a group of peasants – amateur actors: Yusef Idris’s Cotton King, which first showed in a barn in Dinshaway, and was later invited to be performed at Cairo’s National Theatre. With his already burgeoning history of artistic and academic acclaim, Abdel Fattah received a scholarship to study threatre at Warsaw University in Poland, where he obtained his masters in 1976 and his PhD in 1983. But his dreams did not end there. He wanted to study at the Polish State Theatre Academy’s directing department, something that seemed impossible since the academy did not accept foreign students. Yet Abdel Fattah never took “no” for an answer. While he spent years working on his masters and then doctorate theses in theatre at Warsaw University, he also studied Polish literature and history and became involved in Polish theatrical circles. Eventually, having met the long list of challenging requirements set forth by the State Theatre Academy, finally, in 1981, the Academy allowed Abdel Fattah to take the school’s entrance exams. Here he found himself competing with 600 Polish candidates. Several weeks of thorough exams covered four stages of theoretical and practical tests. Eventually the academy selected four candidates of the original 600, among them Mohamed Hanaa Abdel Fattah Metwaly. By the time he graduated from the State Theatre Academy with honors, he had become a well-known figure in Polish theatrical circles, gaining the love and respect of many Polish artists, theatre critics and directors. Many of the professors who used to teach him at the State Theatre Academy became his close friends. 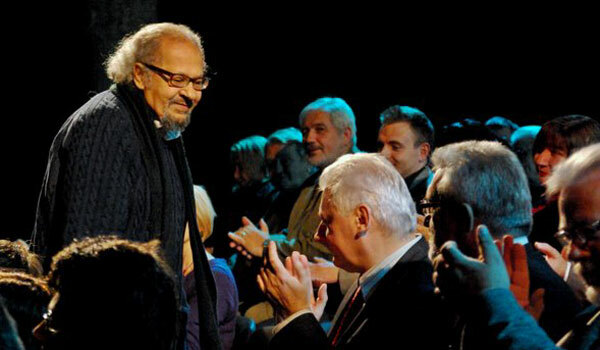 Renowned Polish actor and professor at the Academy, Zbigniew Zapasiewicz (1934 – 2009), was specially impressed with Abdel Fattah’s unique perspective on the meanings and undertones of Polish dramas. As his artistic career flourished his family in Poland was also growing. A wife and three daughters became a passion equal to the theatre. Most of the time, as if following in his own father’s footsteps, he would take us to theatre rehearsals and encourage us to explore the world of arts. Undeniably, the 1980s saw Abdel Fattah’s greatest successes in Poland. Carlo Goldoni’s Servant of Two Masters, which he directed, was chosen as the audience’s favourite in 1986. Hanaa Abdel Fattah returns to the Egyptian cinema in last decade of his life. In 1991, when the critical state of the Polish economy began to affect cultural and theatrical circles, Abdel Fattah decided to return to Egypt. He became a professor, and later head of the acting and directing department at the High Institute of Theatrical Arts. He maintained strong ties with Poland, and he continued to regularly direct theatre productions in both Egypt and Poland. He also translated numerous theatrical and literary works from Polish into Arabic, directing a number of them. It was in the last decade of his life that Abdel Fattah made his return to Egyptian cinemas. In fact, for my father going back to the cinema was the closing of a circle that began when he joined the Egyptian cinema and theatre as a young boy. As he bravely fought his illness, he passed away before it could shatter last drop of his hope. He left behind endless memories and values. Having traversed a long path of artistic accomplishments and received recognition in the highest form, including honorary Polish citizenship for his achievements and the highest awards granted to artists by the Polish and Egyptian governments, he remained amazingly humble throughout his life. He will be loved and remembered dearly, forever.